Off The Rails bring you the unique opportunity to own a reminder of the "Golden Age of British Steam" with our Station Totems and Signs. The designs have been faithfully recreated from the original, and all can be personalised to your requirements, making them the ideal gift for the railway enthusiast. Know what you want? Click on any of the letters below to show all stations that begin with your chosen letter. Simply click on a link below to view all available signs for a specific region. 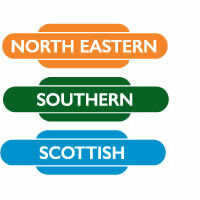 The British Railways Station Totem was introduced in 1948 and proudly displayed at each Regional station. Originally cast in small numbers, today few survive, making the British Railways totem one of the most recognised collector’s items amongst railway enthusiasts and collectors in Great Britain. OFF THE RAILS brings you the unique opportunity to own carefully reproduced scale replicas of The British Railways station totem from each station and region. Each totem is handcrafted to order and supplied in a presentation box. Start your journey here with over 2,700 stations names to visit and collect. We have made these the ideal gifts for the railway enthusiast, as reminder of the forgotten stations that serviced our towns and villages, and the Golden age of British Steam.